See Report Library No. 1004 & 1005, Moy Memorial Survey in 2 parts. S Farrell, 1997. Moy church was built in 1765 probably on the site of a pre-Reformation structure. Visited by OS (N K B) 9 November 1966. A survey of graveyard monuments was carried out at Moy churchyard by S Farrell. An evaluation survey was undertaken of the cemeteries and burial grounds in the Inverness and Nairn areas, including the archaeological, historical and environmental standing of the sites and the monuments contained therein. A note was made of the date, variety, condition and management of those monuments. The study of the environmental factors involved in the survey was developed in conjunction with the Scottish Wildlife Trust. NH 7719 3420 159 memorials recorded. Sponsors: CBA Challenge Funding, Highland Council, Society of Antiquaries of Scotland, Inverness Area Countryside Project, Leader II. Repair of the Kirk of Moy. Estimates amounting to ?63.5.4 from Mason and Carpenter followed by the division of the sum among the Heritors. The Parish of Moy, Dalarossie & Tomatin Submission to Inverness Presbytery put forward arguments for keeping Moy Church as a Necessary Building. Mr Colin Munro of Messrs Thomas Munro & Col, Architects carried out a building survey in 1993, and advised that the rafters of the church are very old and probably date to 1680-1700, pre-dating the present church which was built in 1765. The timber is adzed and each rafter is numbered in Roman numerals. Macdougall, R, 1894, 'Strathdearn - some church notes', Trans Gaelic Soc Inverness Vol. 19 1893-4, p.49-50, 49 (Text/Publication/Article). SHG1554. Farrell, S, 1997, 'Inverness and Nairn Graveyard Survey (Ardclach; Croy & Dalcross; Daviot & Dunlichity; Moy & Dalarossie; Nairn; Urquhart & Glenmoriston parishes), survey', Discovery and Excavation in Scotland 1997, p.43, 43 (Text/Publication/Article). SHG934. <1> Archaeology for Communities in the Highlands (ARCH), 2011, Digital site gazetteer and archive for ARCH Community Timeline Project: Strathdearn, Site 9 (Collection/Project Archive). SHG25599. --- Text/Publication/Article: Macdougall, R. 1894. 'Strathdearn - some church notes', Trans Gaelic Soc Inverness Vol. 19 1893-4, p.49-50. Trans Gaelic Soc Inverness. 49-50. 49. --- Text/Publication/Article: Farrell, S. 1997. 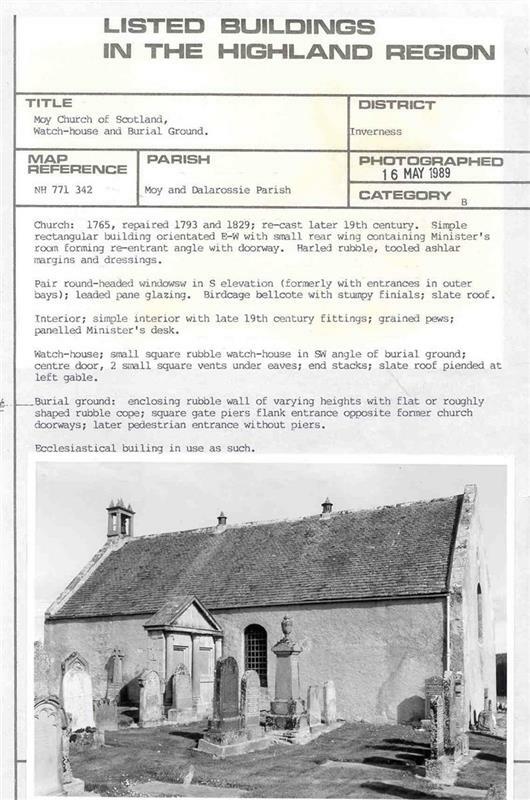 'Inverness and Nairn Graveyard Survey (Ardclach; Croy & Dalcross; Daviot & Dunlichity; Moy & Dalarossie; Nairn; Urquhart & Glenmoriston parishes), survey', Discovery and Excavation in Scotland 1997, p.43. Discovery and Excavation in Scotland. 43. 43. <1> Collection/Project Archive: Archaeology for Communities in the Highlands (ARCH). 2011. Digital site gazetteer and archive for ARCH Community Timeline Project: Strathdearn. Yes. Digital. Site 9.